Fans excited about the New Fantasyland expansion of the Magic Kingdom at Walt Disney World have wondered just when its many elements will open and today Disney has offered an update as to which attractions will be opening – and closing – soon. Back in Aug. 2011, we shared a New Fantasyland opening timeline provided by a Disney Imagineer at the D23 Expo and today’s announcements further elaborate on that information. The most important detail is that Snow White’s Scary Adventures will be permanently closing on June 1, 2012 to make way for Princess Fairytale Hall, a new home for the Disney Princesses to meet and greet with guests. Guests wanting to say goodbye to the classic dark ride will have their last chance on Thursday, May 31, 2012, the attraction’s last day of operation. 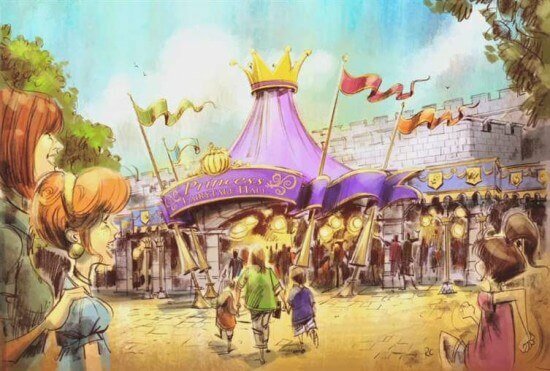 Disney has also revealed that before that, Storybook Circus will open its first areas by the end of March, as the first of many phases of New Fantasyland to debut. Included in that opening will be one half of the “double” Dumbo the Flying Elephant, the Fantasyland Station of the Walt Disney World Railroad, and the reopening of the Barnstormer, now featuring the Great Goofini. Nearby, a Casey Jr. Roundhouse water play area will be opening later in the year, along with Pete’s Silly Sideshow and colorful circus tents. Though not specifically mentioned in today’s announcement, the rest of New Fantasyland should be opening on schedule with the timeline we previously posted. Under the Sea ~ Journey of the Little Mermaid ride, Be Our Guest restaurant, Beauty and the Beast village, and Belle meet-and-greet are due to open some time later this year, with the rest to follow in 2013 and 2014. UPDATE (8/7/12:: Disney has announced the majority of New Fantasyland will open on December 6, 2012, with previews beginning November 19. More details here. And while it will be exciting to watch the Magic Kingdom’s biggest ever expansion finally begin to be unveiled piece by piece, it will be bittersweet as a classic Fantasyland attraction is shuttered for good, with May 31 offering guests one last chance to give it a goodbye kiss. And stay on top of the latest openings and closings in our New Fantasyland section. I just don´t get it. This is a very (technicaly) simpel attraction. Not like Jaws that was hard to maintain with the water and all. And Snow White is insanly popular. Now they close it and open a coaster ride with the Snow White movie theme that a lot of little kids can´t ride and will not push as many people trough it in a day as this classic ride did. Only to make way for a meet and great that can be done outside as done for years. No change to get a glimps of one of the princesses in the ´wild´ but locked away and controled to a more and more spontanity killing Disney. So sad how this is going. The reasoning’s very simple: Fantasy Faire at the West coast Disneyland is a huge, HUGE hit, and it’s turned out to be logistical genius…It had to come East sooner or later. It solved one of the biggest problems on the Disney Moms panel (cramming the Cinderella meals because moms literally didn’t know where to find the Princesses), it’s a reserved area where the little girls won’t look out of place in their dressups, and it stays out of the way of the other attractions. The original 1.0 New Fantasyland idea of giving Cindy and Aurora separate Belle-villages didn’t go over, guests complained there was “too much” princess, no Snow, and not enough ride–And when the first problem was taken out and the other two singlehandedly solved, there was no reason for TWO Snow White rides and a building that hadn’t been built yet. Is Disney World Going to give anything From the ride to Disneyland’s Version of the Ride? This is a great ride. Simple,but good. It will be weird to go to Disney next time without it being here. I was never a fan of the original Snow White ride at WDW. I think the roller coaster is a better ides & I’m sure anyone will be able to ride it. I hope someone records going through the ride on YouTube — like a really good recording with a camera that catches EVERYTHING so that when it closes this can exist forever. Can someone please do this? We have until next June to make it happen before it disappears. YES! I cant wait till it all is done! Although I do conscider “Snow White’s Scary Adventure” a classic part of my early childhood Disney experiences (there was a time when it did, indeed, seem quite scary) it is far from one of the most popular rides in Fantasyland (dark or otherwise). You need only compare the wait times between Peter Pan and Snow White to determine which attraction is simply not a draw any longer. And it is only one of several dark rides to make it, or survive, in the Magic Kingdom from the Disneyland transfer. For the classic Disney experience in Fantasyland dark rides (Mr. Toad, Pinnoccio, Peter Pan, Snow White, Alice in Wonderland) you’d have to go to Disneyland. Disney World’s “New Fantasyland” is an entirely new creation in which an early era dark ride would be out of place in the context of that which surrounds it. I’ve always been terrified of the Snow White ride. Even now, when I’m 13 years old I still have recurring nightmares of it. Honestly, I’m glad it’s getting turned into something new. I have 2 daughters, 8 and 3 1/2. The younger one keeps her eyes closed majority of the Snow White ride and the older one thinks it’s boring. We always ride it for tradition sake……but probably wouldn’t miss it and welcome the new changes!!! I grew up here in Orlando and so I also “grew up” with everything Disney. A part of me is sad to see some of the original rides go. I too remember feeling scared of the evil Queen in Snow White when I was young. It is still nice to see them update the park because the alternative is just watching it age. It has to remain “Magical & New”. What I think as magical isn’t what youngster’s today think is magical. I think I miss the Main Street Electrical Parade the most and then after that If You Had Wings. It would however be nice to see them do a complete makeover of Tomorrowland. I’m still not overly excited with the Stitch ride. Maybe the Imagineers will give some of the Disney Villains their fair share of the spotlight in another part of the park. So sad, this is one of my fave rides. Im 22 years old and still want to go on it! Hell, id even want to take my lil princess to be … so sad i cant pass this down to my lil ones when the time comes. I wish some things were still sacred memorys, and not just another hapless victim of the ” fast paced,short sighted judgment ” that has plauged and taken over the country. I thought part of the “magic” od WDW was passing down our memories as children to our children. I think I remember a whole advertising campaign based on this a coulple of years ago. It saddens me that original rides no matter how mondane they seem to the kids now are being torn down. My daughter enjoyed going on Snow White soely because It’s what I did when I was little. She is excited about the new expansion.. I guess I have to be too in some sort of way. Snow White was a one and done attraction. After taking it in on our first trip to WDW, we never used time for it again. But please, don’t do away with “It’s a Small World”!!! I know it’s very dated, but it’s so dear, and so Mid century Disney! I think this extension is a awesome idea. I am one of the biggest Disney fans out there. I’m 23 and grew up with the stories and magic they have created. Snow white was a classic ride and I’m sad to see it go but I think the new areas are going to be spectacular and really take the families that visit on a journey. The beauty and the beast section is a long over due area as in my many times to Disney iv only managed to see belle and beast once and I think the Aries adventure and Eric’s castle will be a great insight to the movie. I can’t see why adding more to this area is bad, it makes fantasy land more exciting to all ages! I can’t wait to go next summer. I cant belive how many people are complaining about closing down Snow White’s Scary Adventures! I guess you can’t win them all. I mean it was a cute ride I guess but it was outdated and a little boring. WDW can’t stay magical and exciting without implementing some change every once in a while! If we have to close down 1 ride to open one that’s potentially more fun and to double the size of magic kingdom then it’s more than worth it. To be honest, I’m excited for the new Snow White ride, it allows for an older crowd to enjoy Disney too! Plus plenty of children can still ride the coaster. Instead of people complaining on what one thing has to go, they should be celebrating all of the new and exciting things Disney is bringing us! Like The Little Mermaid ride!! Wow to all the people complaining about how scary snow white is….what a bunch of wusses seriously! Well then they should get rid of haunted mansion and space mountain I know some kids that are scared of those rides too. Better yet get rid of any ride with conflict in the story that way no one can be scared or offended. Fear is one of the most thrilling sensations someone can experience and there is something powerful about introducing fear to children so that they can learn to overcome it. Man i rememebr always being scared on snow white, pinocchio, mr toad, but i would never support losing those great rides. Being scared and going through scary things is part of life and very important for kids to know that. Seriously what a pathetic argument for closing an attraction.